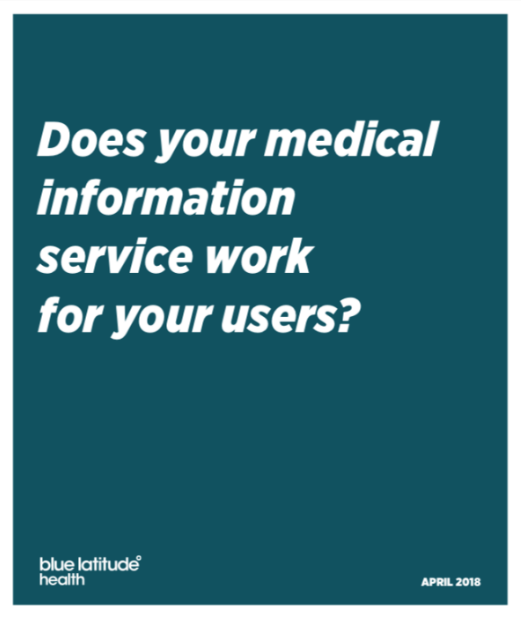 Does your medical information service work for your users? Customer Experience Consultant Nilu Davies reveals how you can ensure your medical information service is fit for purpose. Medical information websites have a reputation for being difficult to use, leading healthcare professionals through a complex maze to access information. Often these sites have confusing navigational structures and unintentional barriers, which prevent users finding information easily and quickly. This creates a negative brand perception or worse, customers give up on website altogether. There are several ways to identify usability issues and improve your medical information website. On one hand, usability testing with target customers is seen as the gold standard for identifying website issues, however, it can be expensive and take a long time to complete. On the other hand, clients use website analytics to efficiently to pinpoint issues, but this data can be unreliable.Website reviews, conducted by usability experts, identify ‘low hanging fruit’ usability issues. They work when usability testing is too cumbersome and analytics fail to give enough information to make problems apparent. A common type of website review is a heuristic evaluation, in which an expert reviews the website and combines their usability expertise and a set of predefined principles to optimise user experience. During a review of a medical information site, the expert acts as a healthcare professional and completes common information gathering tasks such as finding product information, patient resources, and educational resources. As the expert engages with the website, they will identify usability issues, highlight instances where the website performs well or provides a good user experience. This ensures you only change the sections that need improving and learn from the parts that work best. To aid their evaluations, the expert may use guiding user experience principles, which are also known as ‘heuristics’. There are many collections of heuristics for evaluating a website. Although most heuristics tend to focus on interface usability, they can also include other characteristics, which act as a checklist and help the expert to evaluate the site efficiently. This can include good design principles, such as those related to aesthetics; domain-specific principles, including access to prescribing information (PI) within the site; or content related principles, like the information hierarchy on the page.